Stop me if you heard this one already. 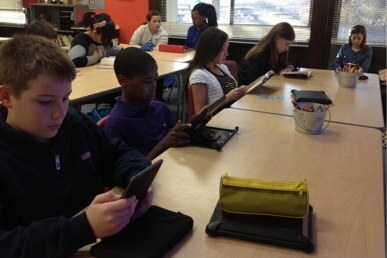 What do you get when you give a student a Nook, an iPad, a Hardcover, or a Paperback? Answer: Reading! Which is superior, which is inferior and why does this matter if what we hope for is to have our students develop a love of reading? I think too often the device conversation can take away from the pedagogical or curricular goal if we are not clear of the objective. I like being able to find the definition of a word without asking someone or getting a dictionary as it removes the stigma of not knowing a word. I also enjoy reading the hardcover edition of a book as I try to find the meaning of the word in the context of the writing. Paperbacks are great as I think of them as consumables where hardcovers are for shelves after I finish like some sort of display of how well read I am or might be if I read all of the books on my shelves. The back story: I was in Ms. Williams’ class the other day getting ready to introduce Membean to her students as part of our trial. We were getting the equipment ready and students were occupied with their free reading time. As I was getting ready to start, I saw this happening and after asking the students if I could take their picture to use on my blog, they all said yes. That lead me to think about so many conversations that have taken place regarding our iPad program. It is not about the device, it is about the learning goals! Read on! By the way, the student iPads now have the Nook app installed so the student would not need to bring his Nook unless he wanted to.